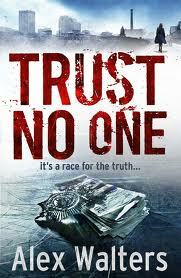 A great debut novel from Alex Walters, who (as far as I am aware) is no relation to either myself or to Minette, Trust No One introduces an interesting character in covert undercover copper Marie Donovan of Greater Manchester Police. As someone who loved the television Murphy’s Law and watching the deep twists and turns in which James Nesbitt in that series got so deep into his character he simply did not know who he could trust, I felt this was a great female mirror image of that. The deep undercover cop is an area which I think deserves more attention in crime fiction, the layers of deceit and general arse-covering whilst running a double-life provide some great set pieces. In this instance, Marie is running a print company, dealing with all the demands of that role including recruitment and slack personnel – all demanding in its own right. Add to that the fact that her partner, Liam, is suffering from multiple sclerosis, oh and the small matter that she is having an affair with Jake Morton, an informer due to give evidence against a crime lord Jeff Kerridge and you can see just how complicated Marie’s working undercover juggling all her roles has become. Then, Jake is murdered, Marie’s on the list of possible suspects and it’s a very short list. She takes off and soon realises that she may be being set up as a scapegoat for the whole case, her undercover status is about to be blown – Trust No One could not be a more apt title. I thoroughly enjoyed this debut. The pacing’s good and the plotting, most of which is against the central character of Marie, is relentless. The only time I had some issue was keeping a check on the timeline when, in one instance in particular, a fall that Liam suffers then leads to quite a lengthy flashback sequence, leaving me wondering when Liam’s situation would be mentioned again – but it may have just been me. A nice addition to the book, and something I love finding, was a short interview with the author in the back pages. This includes comment on his writing regime and background and also the sad revelation that the author lost his wife at a young age to MS. The book is dedicated to her and it’s sad that she never got to read the novel. Alex Walters is a great new voice in crime fiction and a promising start to what I can only assume will be a long running series.